Hang on, we can do that better. Ahem-hem-hem. Okay our Joker impression is a little lacking, so we understand if you're not wearing a smile on your face. Fortunately, we don't need to demonstrate a bad impression. This wig will do all the talking for us! 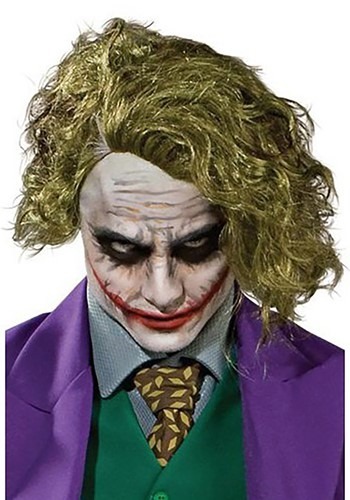 If you feel like letting out your chaotic side, or maybe you just need to impress your Harley Quinn, this wig will be the perfect compliment to any Joker costume. People will be begging you to tell them how you got those scars. And every version of the story you tell will leave everyone in stitches! You'll be the life of the party as long as the Batman doesn't show up to spoil your fun. Of course, you always know how to make him smile, like telling him you've poisoned Gotham's water supply with laughing gas. And while Batman's off running around the city, you'll be making everyone at the party smile from ear to ear. Hahahahahahahahahahahahahahaha!